During Krispijn Larrison and Krista Stackhouse's 2012/2013 engagement, the duo was knee-deep in school and other projects, so like a lot of couples, they were looking to get creative here and there with their wedding costs. Good thing our dashing groom was studying graphic design. 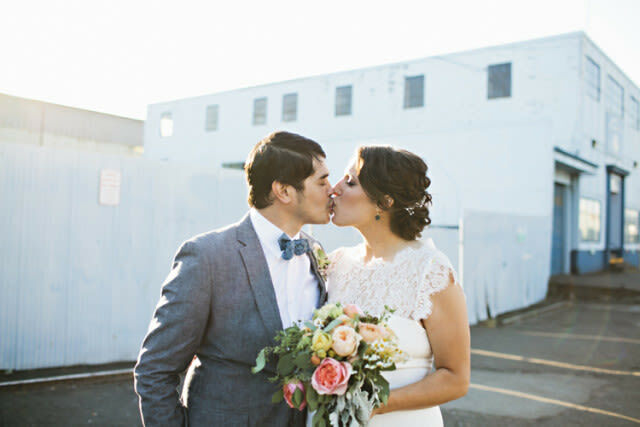 "I was fairly hands-on with certain aspects of our wedding—though, admittedly, Krista carried most of the weight as I was finishing up school," Larrison told us. "Some of the things I handled were branding and color palette, the program and signage design, and the save-the-dates; Krista and I made a short stop-frame animation video using cut paper, which involved painstakingly moving little bits of typography around on a cutting mat and taking a couple thousand photos. " He had us at "cut paper." We had to take a look, and then we had to share it with you, too. "It actually didn't take as long as I thought it would—we were a great team," the groom told us. "We put the video on Youtube and emailed the link to everyone on our list, which proved to be an incredibly cost effective way to get the word out." And there you have it—below. Check out "Krispa's" (get it?) vid, and pick up the summer/fall 2014 issue of Seattle Met Bride & Groom after its July 11 release to read more about innovative, hands-on grooms.